Faina Yefimovna Kaplan, a.k.a. Fanya Kaplan, was born one of seven children to a Jewish peasant family in the Ukraine. She became a political revolutionary at an early age. In 1906, during the political chaos of early 20th Century Russia, she was arrested in Kiev after an accidental explosion of a terrorist bomb, which she had been transporting, killing a maid in her hotel. She was sentenced to life at hard labor and served in various gulags throughout Siberia. At one of the labor camps, she lost her sight, which later was partially restored. On March 3, 1917 after the February Revolution, when the Czar and imperial government were overthrown, she was released from prison. By this time there were major conflicts between the Bolshevik Party led by Lenin and just about all other opposition. Over the next few months, these conflicts led to the dominance of the Bolsheviks and the ban of all other political parties. 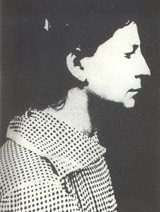 Kaplan, once an anarchist, now an ardent Socialist Revolutionary, decided to assassinate Lenin for what she perceived was his diminishing revolutionary ideals. On August 30, 1918, Lenin was speaking at a rally in a Moscow factory. As he was leaving the building, Kaplan called out to him and when he turned around she fired several bullets at him. Lenin was hit in the left shoulder and jaw. He survived, but it is believed that these injuries were the ultimate cause of the strokes that led to his death in 1924. My name is Fanya Kaplan. Today I shot at Lenin. I did it on my own. I will not say from whom I obtained my revolver. I will give no details. I had resolved to kill Lenin long ago. I consider him a traitor to the Revolution. Although she was "severely" interrogated, she refused to implicate any of her colleagues. She was executed, shot to death on September 3, 1918. She suffered horrible headaches and continuous bouts of blindness for the rest of her life, after prison. During the Stalin era, it was enough to be asked "Are you a relative of that Kaplan?" to be in trouble. Meyer, Daniel. "Fanya Kaplan - Assassin/Revolutionary." J-Grit: The Internet Index of Tough Jews. J-Grit.com. Apr. 2019 <http://www.j-grit.com>.